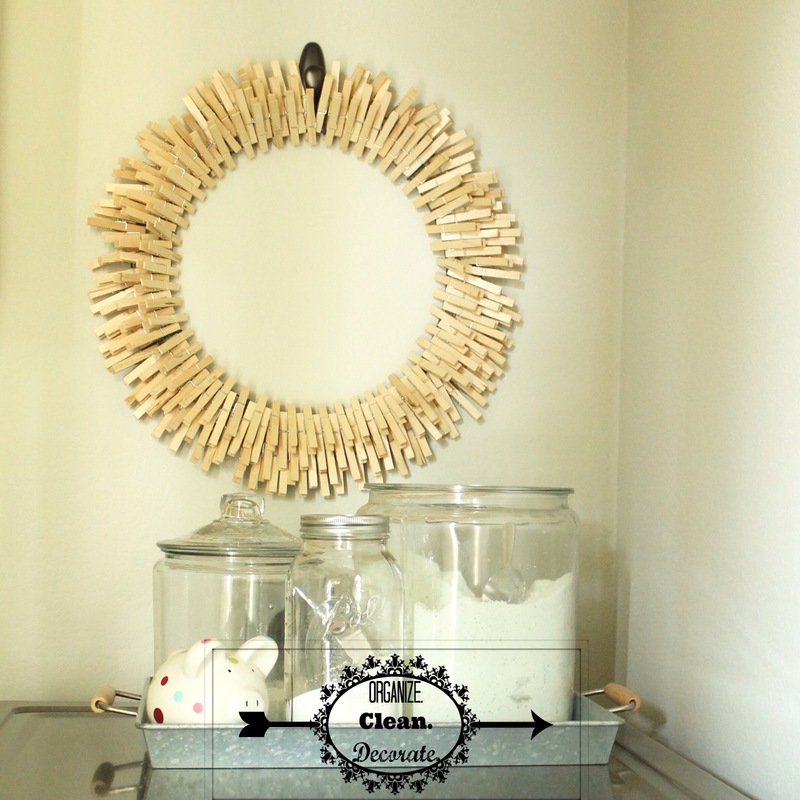 After coming up with the idea to make a clothes pin wreath for my laundry room, and then realizing it probably wasn’t an original idea, I set about to look at troll a few blogs after doing a google search. And sure enough, its been done. By several people. By considering how others had done it, I figured out how I did (and did not) want to create my own clothes pin wreath. During my next trip to Walmart, I picked up this wire wreath form for a whopping $2.77 and a couple of packages of these clothes pins, for $1.88 a piece. A couple hours of time, and a whole $6.53 (plus the cost of maybe half a hot glue stick) later, I had a wreath for my laundry room! I got my daughter (who is quite the crafter) to clip a good third of the clothes pins on, so it was something we got to do together- extra bonus! Girl bonding time! She was more precise about how she placed the clothes pins, whereas I got impatient towards the end and just started jamming them in there wherever they’d fit. Now it fills that awkward empty space above my dryer, and looks cute with the tray that is underneath it. Which, coincidentally, is also from Walmart, as are all the things in the tray! They don’t know who I am, but they seriously should consider hiring me or something- I’m constantly finding ways to use stuff I purchase there for my home.